HOUSTON - For a player who was such a high-profile addition two years ago, Mark Melancon has slipped under the radar over the past two months. His arm discomfort was quickly overshadowed by Madison Bumgarner's pinky fracture, and while Melancon made progress, Johnny Cueto made a trip to Dr. James Andrews. But Melancon should be the first of the injured pitchers to return. 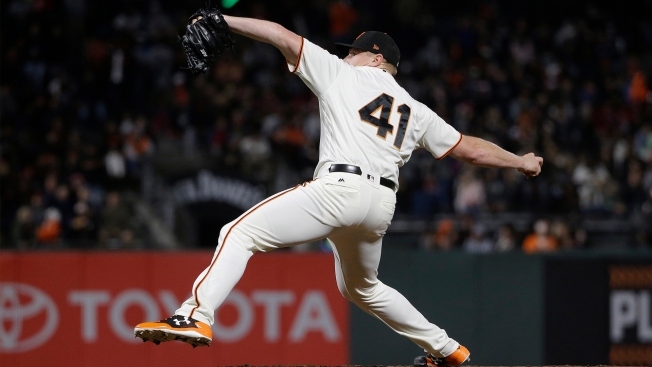 He will start a rehab assignment tonight with the Sacramento River Cats, and if all goes well, Melancon should be back on the big league roster in two weeks. But, what will the role be for a player who was not long ago given $62 million to close games? "It will probably be like last year (when he returned from injury), earlier innings and we'll see where he's at and how he's feeling and how he's throwing," manager Bruce Bochy said over the weekend. "We'll let him get settled in and go that way. I don't want to put added pressure on him as soon as he gets back." When Melancon returned from a six-week DL stint last year, he never pitched the ninth. He saw time in the seventh and then the eighth before shutting it down for surgery that didn't solve his pronator issues. The Giants went into the spring with Melancon set for the closer role, but he was shut down over the final week and Hunter Strickland took over. He has a 2.18 ERA and nine saves in 11 opportunities. Tony Watson, who has closed in the past, has a 2.14 ERA, and Sam Dyson (last year's fill-in) has also pitched well. It's a good problem to have. If the Giants can get anything from Melancon, they'll be adding another quality arm to a bullpen that has been strong at the back end. If Melancon throws so well that he's an option to close once again, Bochy will deal with it. For now, the hurdle is not performance. It's durability. One of Strickland's strengths is his ability to take the ball multiple days in a row, and twice already this season he has pitched three consecutive games. Bochy needs a closer who is available just about every day, and Melancon had to be shut down in the spring after going back-to-back for the first time. The plan is for him to pitch in back-to-back games at least once during the rehab assignment. "It's going to take some time to get there," Bochy said. "With our bullpen situation, the back end has been doing a really nice job. We'll mix him in there and he'll be a big part of it, too. It allows you to rest guys and keep them fresh and he'll be a big part of it."